The ETS TerraSAS series photovoltaic (PV) simulators from Elgar are specially designed for the testing of various solar inverter testing. It simulates the dynamic electrical behaviour of the terrestrial PV solar array. Many solar inverters generate AC ripple on their DC input, which is connected to the photovoltaic array. For single phase inverters, the frequency of this ripple is twice the line frequency. The simulator’s power supplies must not suppress this ripple as a function of their regulation loop. An increasing number of inverters (and virtually all micro-inverters) accurately measure amplitude and phase of the ripple voltage and current to quickly track the MPP of the array. This approach allows tracking the MPP at a much higher speed when compared to conventional dithering techniques (also called perturbate-and-observe). Faster tracking of the MPP results in a much higher overall efficiency in cloudy conditions, where the irradiance is constantly changing. It is likely that all solar inverters will use this approach in the near future, since end users are very sensitive to the overall efficiency of their solar energy installations. To satisfy this requirement, the PV simulator must be capable of reproducing the voltage / current behaviour of a solar array at the ripple frequency. Most standard switching power supplies employ very large output capacitors and inductors in their output circuits and are unable to deliver the required performance - regardless of the response speed of the I-V curve controller. 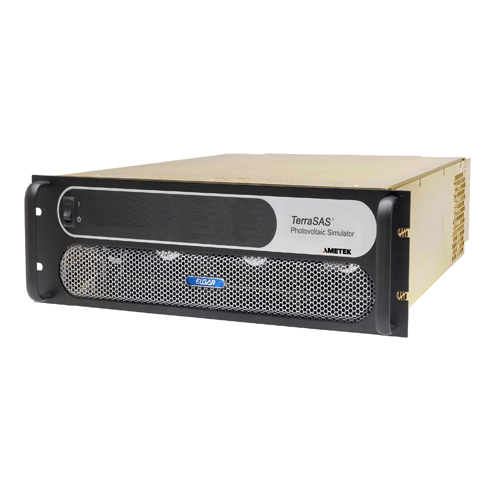 Elgar’s TerraSAS line of PV simulators are based on high speed versions of our standard products, where output capacitors and other speed-limiting components have been adjusted. This results in a speed improvement of 10 times or better. The Elgar Real time I-V curve display is updated 20 times per second to illustrate dynamic inverter behaviour (operating point and sweep amplitude). Compared to other commercially available solar array simulators with an update rate of only 1Hz, this allows more accurate analysis of the inverter’s actual MPP tracking ability.